• Deal Direct • All Tours Privately Arranged • We'll Not be Beaten on Price! 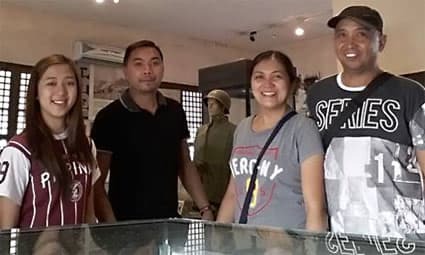 Philippines Staff - Left to right: Angie Presoris - Travel Co-ordinator; Leo Bustamante - Tour Guide (Luzon), Monina Ramos - Office Manager, & Randy Ramos - Driver. 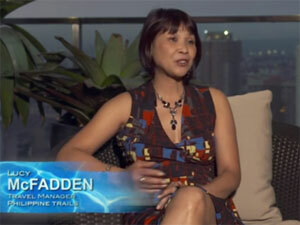 Lucy McFadden talks "Philippines" on TV. At Philippine Trails there are no "middlemen". We have our own local office and staff, and every tour or holiday is privately arranged to suit your travel dates. We're dedicated to harnessing the enthusiasm of the Filipino people who delight in offering their hospitality and services to visitors. Together, our role is to present the Philippines as a wonderfully vibrant, fast developing, and attractive tourist destination. We don't sell mass holiday packages! We're an independent company that prides itself on personal service. We tailor holidays to suit each individual enquiry. We liaise and work with each customer individually, to give them the holiday that suits their timescale, budget, and interests. Our customers come from all countries all over the world - UK, USA, Australia, New Zealand, Canada, Korea, South Africa, to name just a few. We know the Philippines. We regularly travel around the islands familiarising ourselves with what the country has to offer as it rapidly develops its tourism industry. Our Drivers and Guides are friendly and reliable, as are the associates we have long worked with around the various islands. At Philippine Trails we're enthusiastic about promoting the Philippine Islands and are keen to share it with you! Whether you're travelling on a budget, or looking to enjoy the best luxury accommodation, we know the hotels and resorts that we include in our itineraries. We only recommed those that we are familiar with, have visited, and with whom we have a good working relationship. Whether you're looking for a private tour exploring the islands, a holiday relaxing or snorkelling the warm waters from a beach resort, PADI diving tuition, a private birdwatching tour, trekking the jungles or mountains, catching a wave surfing, a luxury honeymoon, or a holiday to simply unwind, the Philippines has it all, and our team is waiting to arrange an itinerary for you! 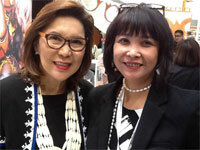 Philippine Trails Ltd is a member of the Travel Trust Association. Registered Number U6131. This means that you can book your holiday secure in the knowledge that Travel Trust Association will protect you in the unlikely event of a member becoming insolvent.